I feel that now is the perfect time to publish this, as I have officially moved out of this town. I grew up on the west side of Center Street in a small town called Ithaca in the mitten-shaped state of Michigan. It’s not the greatest place in the world, and I don’t necessarily like it (I’ve always wanted to escape it), but it’s my hometown and I (reluctantly) admit that it holds a special place in my heart because of that fact. Now, you’re thinking about the name: Ithaca. A name of legendary renown. And if you’re American, you’re probably aware of Ithaca, New York, home to Cornell and Ithaca College. Well, my Ithaca isn’t anywhere near that prestigious. But we do have a really nice school system, the best in the area, and we have a really nice football stadium in the process of being built. (Update: our school has worsened in the past two years as far as academic performance goes, but the football stadium is really nice). The area is definitely not wealthy enough to afford this new stadium, but a man named Steve Smith has generously donated to the school to have it built. I know Steve fairly well as he is a family friend, but really, who in this town isn’t at least a family acquaintance? 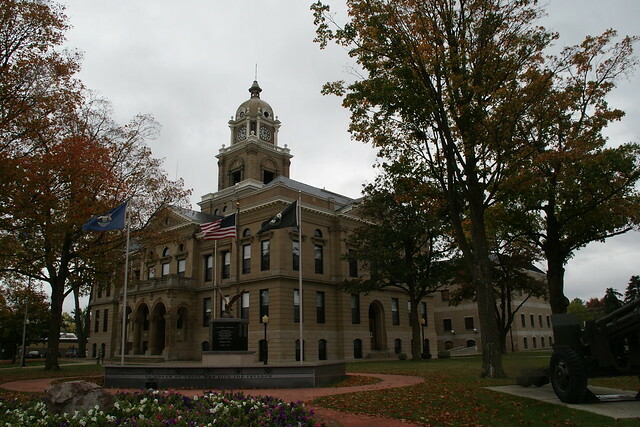 Ithaca is also the county seat and we have a very old, but very beautiful courthouse. Speaking of how everyone seems to be at least a family acquaintance, I should comment on the size of this “city,” as it likes to be called. It is home to roughly 3,000 people and though I may not know every single person that lives there, I certainly feel like I do. But, it being a small town, it’s hard not to know the majority of people that live there. And since everyone knows everyone, nothing ever slips past anyone. It drives me crazy, and it definitely drove me insane when I was in high school. You will never have privacy in a small town, remember that. Ithaca was founded in 1857, and a few years ago now, we had a huge (by Gratiot County’s standards) sesquicentennial festival. Nearly everyone in town took part, even me. My friend and I took part in the fashion show run by Ithaca’s only furniture store (it has since gone out of business); the fashion show featured fashions from all decades from 1860 – 1980. Every year there is an annual FunFest in August, though I am here to tell you that it is not that fun. There is a beer tent though, with live music from local bands (which aren’t half bad) and my family goes each year to said “Hospitality Tent” and has a roarin’ good time. There is a winery on Main Street that produces its own wine and beer and they have a fine selection of red wine, and even the blushes are really good. You can even request to make your own wine there, my parents and neighbors have all done it and it has always turned out well. At this winery, there is Friday night karaoke and though I’ve never been, my parents say it’s a great time. On the shadier side of things, there’s always the Brick Alley Pub, which is right off Main Street; I’ve always been told that it’s a rougher crowd that goes there, but I’m sure they’re good people. There’s a small bridal shop on Main Street, and the best pizza in the area a block down from that called Main Street Pizza. I recommend the Chicken Bacon Ranch pizza and Street Sticks. There are myriad fast food restaurants, though nothing too interesting, since Michigan doesn’t have much by way of anything except the occasional White Castle, though you’ll not see that in such a rural part of the state. There’s even a bakery inside an ice cream shop on East Center closer to U.S. 127 that has baked goods that are gluten free, which is great for me! I don’t actually think that most people in Ithaca even knew what gluten free was until that bakery popped up. There are two other bakeries as well, one ran by a very nice middle-aged man, though I don’t really like the baked goods there, and my guilty pleasure: The Hearthstone Oven, ran by a Mennonite family that serves breakfast and lunch, along with a mean cinnamon roll. Ithaca is also home to a public library, three dentist’s offices, three doctor’s offices, a rehabilitation clinic, a senior center, two industrial parks (though they’re quite small), and lots of churches. So if you ever need to be saved on a Sunday morning or even Saturday night, they’re here for you. I particularly like St. Paul’s Catholic Church, but I may be a little biased since that’s the church my aunt goes to and I really love the nuns and priest. Everyone is very friendly so long as you look ordinary, but otherwise you’ll be faced with the “Ithaca Glare” as my best friend from high school named it. It basically means that if you don’t meet their standard of person, you will get the stink eye. I have been on the receiving end of that glare many a time, especially the time I dyed my hair blue. All in all, it’s a great place to grow up and a great place to want to get away from. I’m sure there’s plenty more to say on the matter, but I just can’t think of anything else that isn’t tainted with my teenaged hate for a place I’ve always wanted to run away from.